As exemplified by the current socioeconomic and political climate, a new era of revolution is now among us, and the country's students are unapologetically leading the charge. Capital Prep Harlem's sister school, Capital Prep Harbor, in Bridgeport, CT, just dropped the gauntlet in their video, "Dear America." These young leaders are poised to change the world and their video tells you how they plan to do it. "Dear America" is the brainchild of Capital Prep Harbor's 10th-grade civics teacher, Sara Winant. She challenged her students to write an open letter to America. What unfolded was their original and amazing spoken word piece. "We are in a time where adults are the ones talking and making decisions around our kids future," Winant shared with REVOLT TV. "We need to make the space to have our kids speak up, have people listen, and take action. At its core, that's what 'Dear America' is—a call to action." "Dear America" is what the students said when they were given the opportunity to speak honestly, brilliantly weaving together statistics about the reality of what communities of color must endure and overcome while asking important, difficult questions about what the future will hold if immediate action isn't taken. Throughout the black and white video, students speak their truths. Each impassioned declaration is backed with affirmations and solidarity of the other students. The video juxtaposes scenes from inside a classroom along with handwritten notes further emphasizing the hard-to-swallow, but always honest, messages. But the real impact is felt when students make declarations such as, "Dear America, how can you say that our nation is free, when whites and Blacks, they still don't agree? Can't you see who you made us out to be? A place where there is no peace, a place where police brutality increases, a place where a child's dream subsides, can't you see why our so-called great nation cannot raise?" Inspired by the school's success rate and mission, Sean "Diddy" Combs partnered with the Capital Prep Schools' founder Dr. Steve Perry to form a network of schools to empower Black and Latino children through education. Together they are developing students who are ready for the world to hear their battle cry. Capital Prep's students are not afraid to call out racism, inequality, police brutality, or any system that has long been designed for Black and Latino people to fail. From calling out Donald Trump's presidency to shining a light on the unequal access to resources found in the education system, Capital Prep Harbor's students have declared, "Class is in session." Not only that, but America is finally starting to take notes, and more importantly, take action. 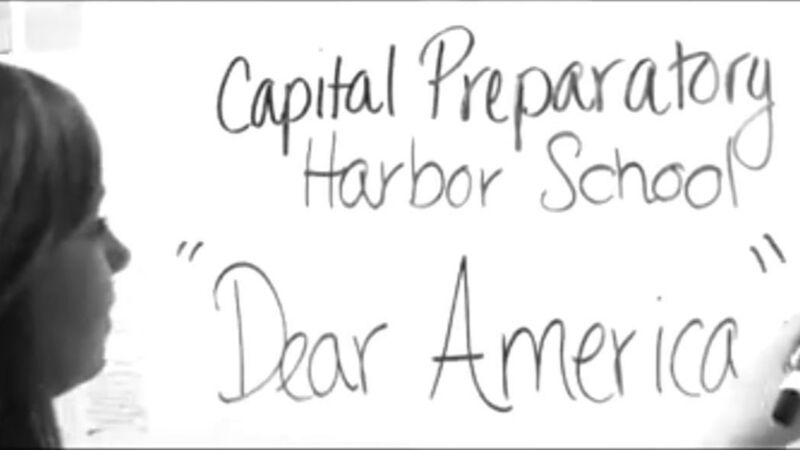 View the powerful video, "Dear America," by the students of Capital Prep Harbor, above.